Tickets include a 1 welcome cocktail, 2 course meal, entry to NYE event and a private table in our rooftop wigwam bar from 8pm. Food will be served at 8.30pm so all ticket holders must be seated by this time. Tables will be reserved from 8pm. Tables will be of 2 -6 people, so please email your booking confirmation to erica@mothershipgroup.com once tickets have been purchased to book your table. Ticket Includes: Tables will be of 2 -6 people , so please email your booking confirmation to erica@mothershipgroup.com once tickets have been purchased to book your table. This ticket allows entry for one person to Queen of Hoxton NYE. In includes entry only. Last guaranteed entry will be 10pm. 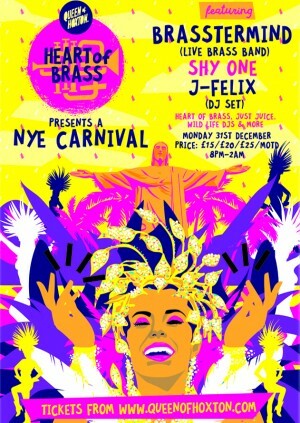 Welcome to Heart of Brass NYE Carnival! So, here's the deal - we can't promise to bring the sunshine.... but we've sorted everything else! A 3-floor house party extravaganza hinting at warmer climes from around the world and bringing you the best in Live Brass Bands and DJs playing an eclectic mix of summer soul, global funk, world disco and party classics. This NYE, Brasstermind, one of the UKs premier Brass Bands will be bringing in 2019 in style, playing their infectious mix of brass band versions of feel-good classics, original songs and mashups alongside our carefully selected roster of residents and hosts. Supporting in the main room isTouching Bass, BBZ, CoOp label affiliate Shy One as well as True Thoughts very own J-Felix. They’ll be spinning a real mix of sweaty sounds from across the globe including House, Disco, Funk, Latin, Afro and Dub cuts from carnivals around the globe. In room 2, Clarks & Unruly will take the carnival vibe to the next level with their take bass heavy take on Dancehall, Bashment, Tropical Bass Music, Socca and more. Expect carnival vibes and whistles! Brixton's favourite masterminds of brass, Brasstermind are a 10 piece collective who have been playing together round London and the UK for many years. Featuring brand new material and all manner of infectious grooves to keep you shaking your thing. Expect original brass music and classic brass band covers that will keep the carnival vibes going well into the night! Shy One lives and breathes the eclecticism and diversity of her DJ sets and productions. Having started off DJing on pirate radio at 13 years old, Shy One has been exposed to and influenced by the full spectrum of sounds her hometown of London has birthed and nurtured over the years. As with many teenage Londoners at the time, grime and the wider family of indigenous London club music was what gave Shy One the passion to pursue music as more than a pastime. Obsessively collecting white labels by some of her local production heroes quickly developed into obsessively making beats in Fruity Loops for a plethora of different crews and MCs bubbling up in Harrow, the North West London borough she grew up in. Undeterred by those in the scene who called her beats “weird” or “different”, Shy One ploughed on carving out her own sound which eventually caught the ear of Scratcha DVA, who went on to release the Decaffeinated Love EP and her debut LP, Bedknobs and Boomkicks, on his now renowned DVA Music imprint. Since her initial releases with Scratcha, Shy One has continued to grow as an artist and diversify further into a somewhat undefinable sound that’s origins are undoubtedly London but take in a huge variety of musical cultures, from hip-hop and jazz to house music and West London’s own brokenbeat movement – all of which are well represented on her various radio shows across stations like Balamii, NTS and Rinse FM. As well as DJing and releasing music more recently on labels like Diskotopia and Through My Speakers, Shy One is also a resident DJ and part of London’s BBZ and Touching Bass collectives – two forward thinking groups of artists, DJs, and activists that strive to create a space for London’s marginalised LGBTQI+ and POC communities respectively through art, music and culture.